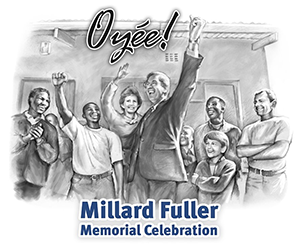 When: March 14th, 2009, 2 p.m.
* Last updated March 9 – Excitement is building for the celebration of the life and legacy of Millard Fuller to be held Saturday, March 14, at 2 p.m. at Ebenezer Baptist Church in Atlanta. The service will take place in the Horizon Sanctuary, the magnificent new addition to the historic church built in 1886, where the Rev. Martin Luther King, Jr. once co-pastored with his father. It is adjacent to the Martin Luther King, Jr. National Historic Site, which is home to the museum, boyhood home and final resting place of Dr. King. 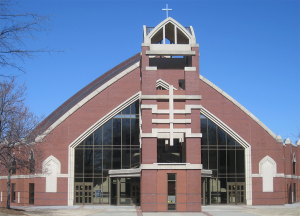 Millard Fuller had the honor of preaching at the original church in December 1993, and he was also the 1992 recipient of the Martin Luther King, Jr. Humanitarian Award. The public is invited to attend the celebration, and the Fuller family and staff of The Fuller Center hope you will join us. The memorial service will be both a tribute to and a joyous celebration of the man who founded both Habitat for Humanity and The Fuller Center for Housing with his wife Linda. The service will be opened by current senior pastor of Ebenezer, Rev. Raphael G. Warnock. Former President Jimmy Carter and his wife Rosalynn will attend, and Carter–as well as Habitat and Fuller Center homeowners—will speak about Millard’s work and influence on their lives. Uplifting music will be performed by the Ebenezer Baptist Church (Gospel) Choir and Atlanta’s Feed & Seed Band. Popular Australian-born country music entertainer Jamie O’Neal (“There is No Arizona,” “When I Think About Angels”) will perform “Look What Love Built,” a song she composed in honor of Millard and Linda which was featured on a CMT television show about the Fullers. We are delighted to announce that Millard’s longtime friend and supporter, former Habitat for Humanity board member and fellow world-renowned charismatic speaker, Dr. Tony Campolo, will be the keynote spokesperson for the celebration. Prior to the celebration, The Fuller Center of Greater Atlanta will dedicate two houses, one for the Scott family at 75 Fitzgerald Street, SE, just blocks from Ebenezer Baptist Church, and one for the Nash family at 1427 Glenwood Ave. The houses are two of 30 homes damaged by the March 2008 tornado which are being repaired by FCH of Greater Atlanta. The public is invited to attend the dedications. The Nash’s house will be dedicated at 9:00 a.m., and the Scott’s house will be dedicated at 10:45 a.m.
At 3:15 p.m., or directly following the service, guests are invited to march to the Scott’s house a few blocks away. Linda Fuller will present the homeowners with a Bible, as is customary for Fuller Center house dedications. After that, around 4:00 p.m., guests are invited to return to the church for an (optional) open-mic session inside Ebenezer. Anyone who wishes to come forward to reflect, reminisce or say a few words about Millard is invited to do so. The Sanctuary will close at 5:00 p.m. to prepare for Sunday worship services. 10:00 a.m. – Sunday school led by former President Jimmy Carter at Maranatha Baptist Church in Plains, Ga., (http://mbcplains.com/index.php/sunday-school/). Doors open at 8:30 a.m. Worship service is at 11:00 a.m.
1:30 p.m. – Meet at Koinonia Farm (http://koinoniapartners.org/) for fellowship and a walk (or drive) to Millard’s grave. We will then hold a simple, 30-minute service at the burial site. 3:30 p.m. – Enjoy a film about Millard and Linda’s vision and the history of Habitat for Humanity at the Global Village & Discovery Center on the Habitat campus. Tour the Poverty Housing section and see models of houses built around the world. 6:00 p.m. – If you are spending Sunday evening in Americus, please join us for potluck supper at Koinonia Farm. Doors to the Horizon Sanctuary open at 12:30 p.m. Please note that due to street closings in downtown Atlanta, we advise you to get to the church by taking exit 248B, Edgewood Avenue (toward Auburn Ave./J.W. Dobbs Ave.) off of I-75/I-85 instead of taking surface roads near downtown. Parking is limited and is on a first-come first-served basis. Free parking is available in two specially designated parking lots on the north and south sides of John Wesley Dobbs Avenue between Jackson Street and Boulevard, and there will be attendants there to direct traffic. You may also park on the street in surrounding neighborhoods or take MARTA rapid rail public transit to the E-2 King Memorial Station. Visit itsmarta.com for details.